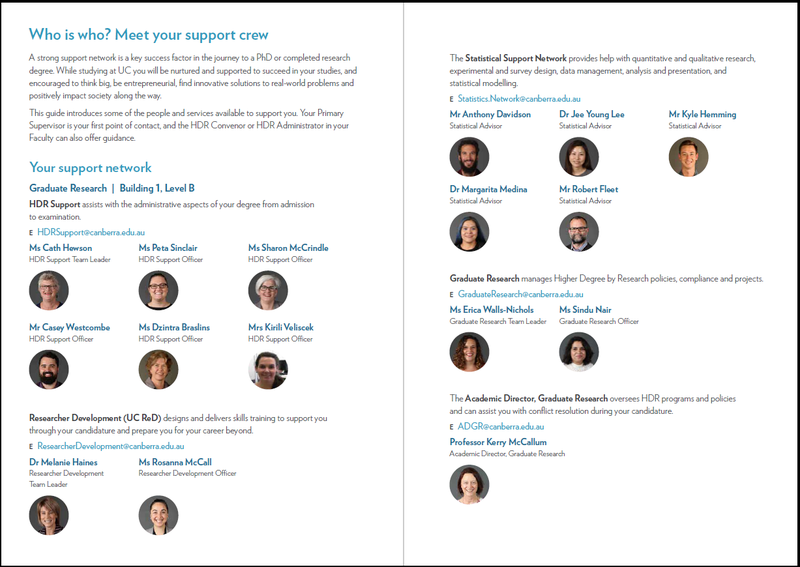 The brochure provides details of the groups and individuals across the University available to support you and your research. Work through the to-do list on the last page to make a start on your research journey. See the Higher Degree by Research Frequently Asked Questions for more information or email the HDR Support team. a list of Generic Skills researchers are expected to achieve and what they may mean in practice. The University supports the Principles for Respectful Supervisory Relationships, developed jointly by Universities Australia, the National Tertiary Education Union, the Council of Australian Postgraduate Associations and the Australian Council of Graduate Research. The Principles provide universities with high level guidance on matters such as sexual relationships and sexual assault and harassment, and have been developed to protect the safety and wellbeing of both students and university staff.